The Flaming Lips recently released a 24 hour-long song called “7 Skies H3.” I’m actually listening to a stream of it right now on a website (http://flaminglipstwentyfourhoursong.com/) as I write these words. I like this music. So far–30 minutes in–it’s been a lot of long feedbacking tones on guitars, washes of cymbals, and vocal wails that periodically resolve together on a chord change. It sounds very loose and improvised and all about the slowly evolving long drone. What’s equally interesting about this release is its packaging. 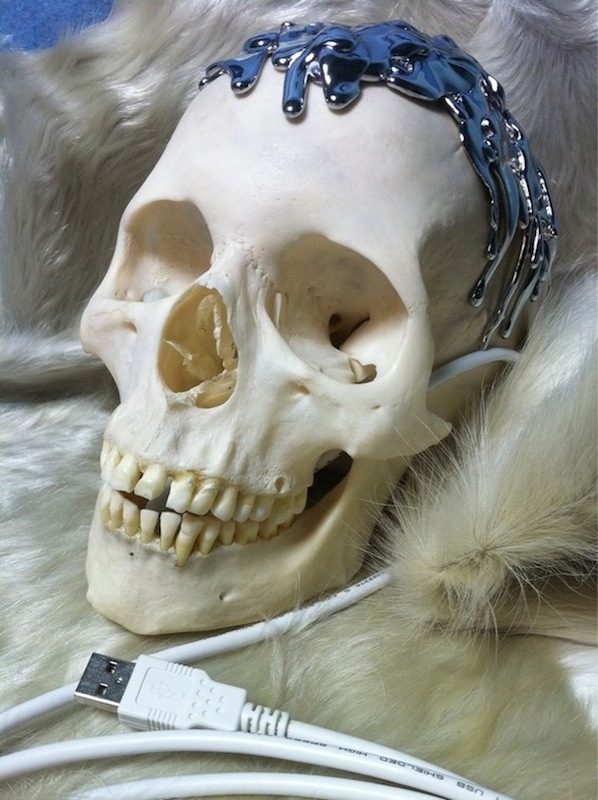 “7 Skies H3” comes on a hard drive encased in a real human skull (!) and costs $5000.00 to purchase. The catch is that the band only made thirteen copies of their release and surprise, surprise, they’ve already sold out. “7 Skies H3” is quite a gesture in our era of evanescent MP3s and 99 cent Apple iTunes downloads. If you were to actually get your hands on this release you’d have yourself a very permanent physical momento as well an entire day’s worth of sound. It’s hard to ignore this kind of artistic gesture because it’s so lavishly physical and imposing, flying in the face of the essential disposability and interchangeability of many popular songs today whose contents we can easily browse/shuffle/add/delete on our digital devices. And because of its size, “7 Skies H3” is probably impermeable to this kind of toying around. For that matter, how would a remix DJ ever decide where to start taking the music apart? It’s just too colossal and that’s the point: “7 Skies” isn’t a song, it’s a slow-moving weather system. An innovative idea to make only 13 copies? Will others copy it?